It features delicate and exotic varieties. Corals play an important role in the ecosystems throughout the world’s oceans. Use this attractive, sealed exhibit to introduce your students to the diversity of these colonial organisms. 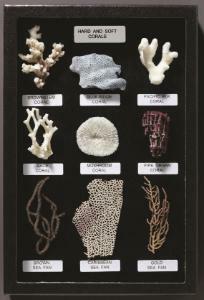 Both 'hard' and 'soft' coral specimens are well represented in an array of forms and colors. Included are typical stony corals such as Brownstem and Elk Horn, the uniquely colorful Blue Ridge and Pipe Organ, and the delicate Brown Fan, Carribean Fan and Sea Whip. Other specimens may vary with availability. Ordering information: As these are prepared from real specimens, the product you receive may appear different from the photograph.